This little Christmas ornament was inspired by a tiny sticker, of all things. This is a simple craft project with basic stitching. Pattern plus directions below. Right click, copy, paste, and print pattern. 1. You might need to shrink the image. Cut out two bird cages on the dotted lines in the off white felt and one bird (on the solid line) in the blue felt. 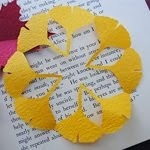 Cut out a small orange triangle for the bird's beak. 2. Using a back stitch, embroider the wing on the bird with two threads from a strand of dark brown embroidery thread. Make a french knot for the eye. 3. 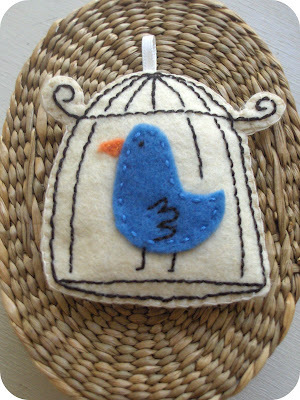 Using a running stitch, sew the bird onto the bird cage. Using a running stitch, sew the beak on as well. 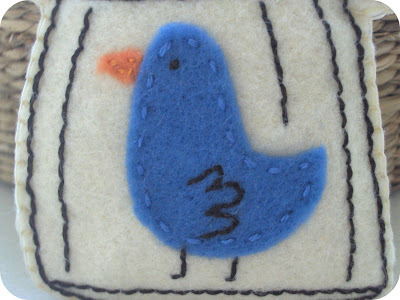 Using a back stitch, embroider the legs of the bird on the off white felt (refer to picture). 4. 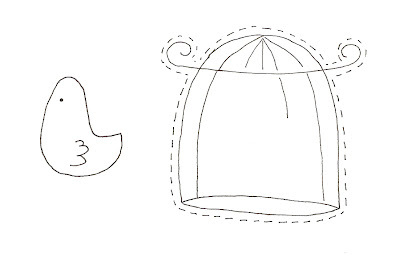 Using a back stitch, embroider the bird cage design around the bird (refer to picture). When embroidering the top of the bird cage attach the ribbon loop on the back of the felt piece. 5. Using the thread, sew both bird cage pieces together around the edges with a blanket stitch. Leave a one inch opening. Stuff will poly fill. Sew up the opening. Done. Such a cutie! I've been a bad commenter lately, but have been reading faithfully and hope you have a wonderful holiday. Thanks for all the great ideas, not the least of which is this great little pattern. Adorable - such a cute idea. Thanks for the detailed instructions too - I think even a non-sewer like me could handle it. thanks tricia. if you do give it a try, let me know if you have any questions. 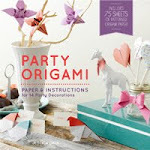 This is so cute and would be a great anytime gift! I think that is the cutest ornament that I've seen in all of Blogland! Ok, it's official, I need to do a bird themed tree. There are just too many darling bird ornaments out there! I'll be linking. Very cute! Thank you for sharing it with us! Outstanding great tutorial & pattern. Going to sit down and make a few thank you so much! Is it looking like christmas yet? No kidding in Calif we had snow. Super duper cute ornament. Thank you for sharing the love. Just adorable! Thank you for sharing this! Hope your holidays are merry & bright! So sweet! Thanks for sharing with us. Can't wait to make one of my own! Please visit to my blog to receive your award. hey! thanks for stopping by my blog - I remember seeing your little felt bird cage ornament somewhere on the interwebs this last wee and being very impressed - super cute! Adorable! I've scheduled a link to this post to go live on my blog mid-day tomorrow (Central USA time). I hope it brings you a few extra clicks. This is beautiful! Thankyou so much for sharing! this makes me happy. thank you for sharing! One of the cutest ornaments that ever lived! Really cute! Thanks for the idea! What a great little design! 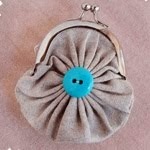 I really wanted to make it but how do you get the birdcage pattern in the white felt or don't you need to? It is absolutely lovely ! Beautiful! It reminds me of one of my favourite kids books "How to paint the portrait of a bird". So Beautiful!!! Thank you for your great tutorial!! !